We modified this red beans and rice recipe to fit our healthy diet guidelines. For example, we changed white rice to brown rice, and we use fresh vegetable ingredients. My grandmother was from Algiers, Louisiana, and my mother was born in New Orleans. My mother was a master of Southern cuisine. 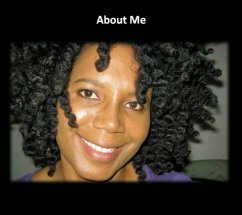 She made gumbo, shrimp creole, and many other dishes native to that region. We do this recipe our way, and we shortened it a little bit. So we gave it a Southern spin, but we do it The Healthy Diet Paradise's way. 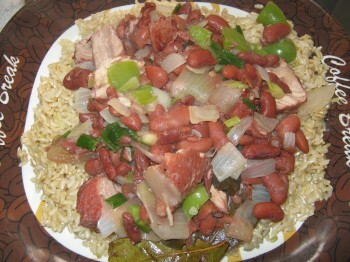 We also make this red beans and brown rice with boneless pork ribs. You can add or delete any ingredients you'd like to suit your tastes. You need to prepare brown rice for this meal. Click here to learn how to cook brown rice. looks in a crock pot! We are going to use whole foods and all natural ingredients. If you feel more comfortable with canned kidney beans, you can skip the step on how to cook dried kidney beans. If you use canned kidney beans, make sure they are plain. No sugar or other additives or flavors. Cook the brown rice according to directions, and set it to the side. You can also cook the rice closer to the time you think the pork and beans will be done. That way you can serve the brown rice hot. Pre-wash and then soak the red kidney beans overnight in a large bowl. Some of the beans may split. That's a good sign. The water will have a slightly brownish color. You are going to use that same soak water for cooking. Take the pre-soaked beans and the soak water and put them into a large pot. Add one garlic clove, two bay leaves and a sprinkling of sea salt. Cook the red beans on a low heat for about an hour to an hour and a half. If you need to add water, boil the water first before adding it in. Then make sure the beans are covered. 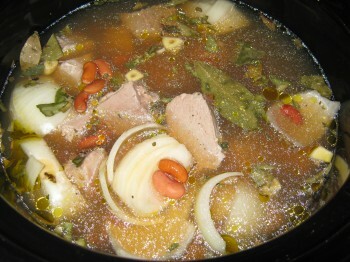 Cook until the beans are tender (1-1/2 to 2 hours) Times may vary. Beans can be tricky, so watch them very carefully to make sure they don't dry up and burn. Bake the pork ribs at 45 degrees for 10 or 15 minutes. But don't cook them all the way, because you want tender pork. You can add salt and pepper to the pork for added flavor. Once the pork is done, place the pre-cooked pork in a slow cooker with sea salt, pepper, 1/2 onion, chopped garlic and 2 or 3 bay leaves and desired amount of Creole seasoning. Add extra water to cover this mixture. Remove the onion when this recipe is done. The 1/2 onion is used only for flavor. Note: You do not have to add pork for this red beans and rice recipe. You can use pork bones or even smoked turkey chunks. You can also add in liquid smoke in place of the pork. That will give your red beans and rice recipe an authentic smoky flavor. Sneaky, huh? Just be sure not to use too much. After about four or five hours, the pork chunks will be done. Turn the slow cooker off. Now it's time to saute your vegetables. Saute white and greens onions, creole seasoning, chopped bell peppers, a clove of garlic, and lightly saute it in olive oil. 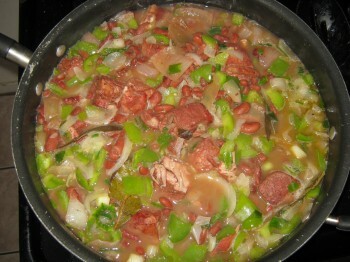 Next, pour your pork chunk and two cups of red beans into the same pan you cooked the vegetables in. Add a dash of liquid smoke if desired. Cook this mixture on medium for another three to five minutes. This gives the spices and flavors a chance to blend. Then serve over a bed of hot brown rice. Top with fresh parsley. This meal has an earthy, rich flavor. This red beans and rice recipe has a comforting effect on the soul. Red beans have a very beautiful texture and taste. There's nothing on this earth like it. Red Beans and Rice Recipe!